PITTSBURGH — Asked if he will eventually land a robot on the moon, William “Red” Whittaker doesn’t hold back. 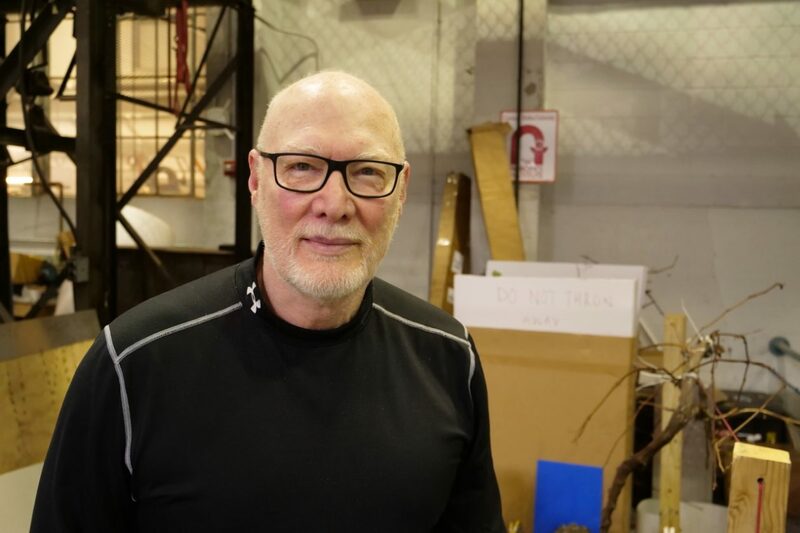 “Oh, hell yes,” says the Carnegie Mellon University roboticist, showing the enthusiasm and determination that have fueled his career, leading the development of robots that have changed the nature of what machines can accomplish. 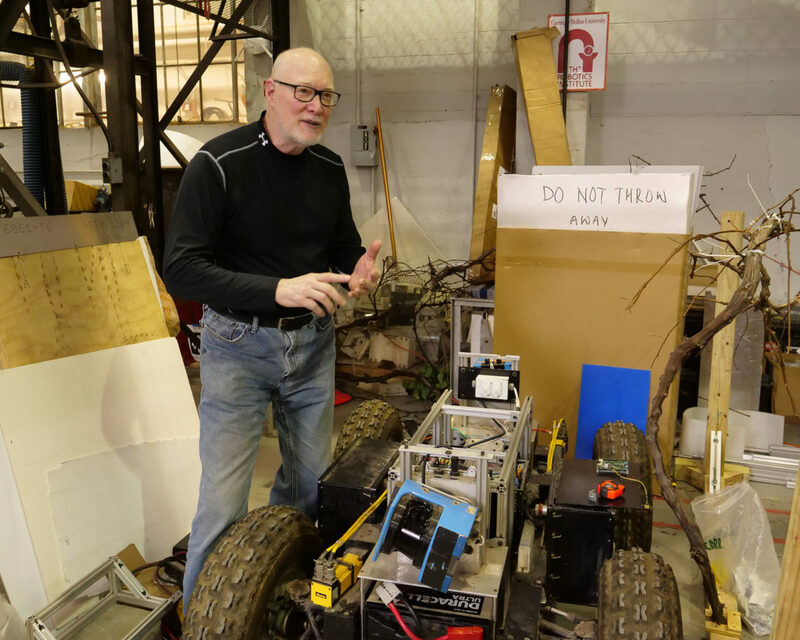 They haven’t landed one on the moon, yet, but Whittaker and his colleagues have sparked the rise of robots in Pittsburgh and beyond — in areas including nuclear cleanup, autonomous farming, robotic mining and self-driving cars. Their work in the Field Robotics Center at CMU’s Robotics Institute laid the groundwork the spinoff companies, engineering centers and institutions that now populate this city. A revered figure on campus and in the technology community, Whittaker’s mantra is to “develop, secure and feed the world, and explore worlds beyond.” Those efforts started with his early work developing robots for the cleanup of the Three Mile Island nuclear accident, extended through his team’s victory in the $2 million DARPA Urban Driving Challenge, and continued with attempts to land a robot on the moon in pursuit of the Google Lunar X PRIZE. And Whittaker isn’t done yet, still working on new projects to further advance the field of robotics. Whittaker has led some “insane robotic exploits over the past three decades,” says Andrew Moore, the dean of CMU’s School of Computer Science. Now, he is pursuing another prize: Amazon’s HQ2. Pittsburgh’s proposal for the tech giant’s second headquarters included a letter from Whittaker making the case for Amazon to consider Pittsburgh’s robotics prowess as part of its search. Pittsburgh is one of 20 cities in the running for the $5 billion campus, and while it’s considered a long shot based on Amazon’s requirements, robotics is one of its strengths. “I love the idea,” Whittaker said of Amazon HQ2 while showing us around The Robotics Institute on a recent Friday afternoon. “I like that kind of energy, I like that kind of progressive technology. I like Jeff Bezos. My sense is that it would be a two-way street, where Pittsburgh would be a lot of good for them, and Amazon would be a lot of good for Pittsburgh. We would really get along. Whether or not it works, it’s a logical pitch to make. Amazon is one of the world’s largest commercial users of robotics, thanks to its global fulfillment centers, where robots whir around the floors and smoothly lift large pallets of products. 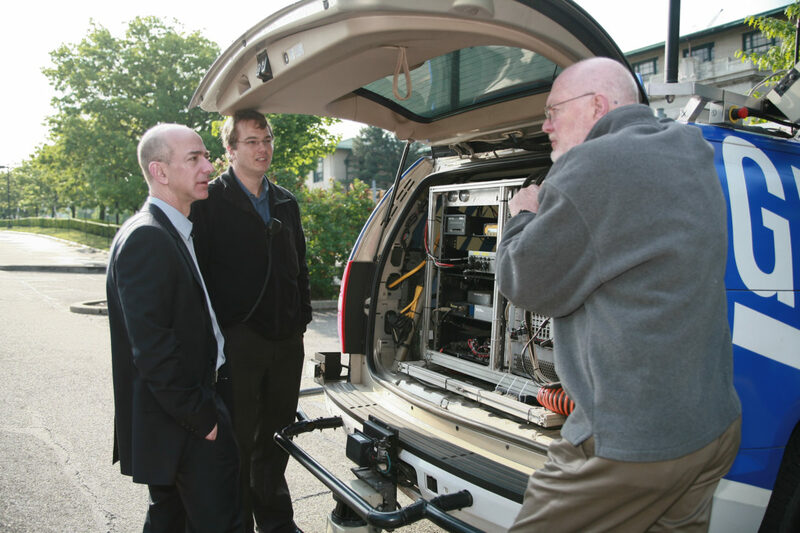 Bezos is familiar with Whittaker’s work, having invited the roboticist to Seattle after Whittaker’s team won the $2 million DARPA Urban Driving Challenge. Whittaker and Bezos also share an ambition to land on the moon — the Amazon founder through his Blue Origin space company, and Whittaker through Astrobotic, the spinoff company that pursued the $3 million Google Lunar X PRIZE. This is a common theme running through Whittaker’s work, reflecting his philosophy about the future of robots and automation: It’s not as much about machines replacing humans or taking our jobs — it’s about robots doing the stuff that we can’t, shouldn’t or don’t want to do. Asked about how robots and automation will most impact the world in the coming years, for example, he pointed to the safety implications of self-driving cars. With so much to do here on Earth, why focus on the moon? Sitting at the conference table in his office, Whittaker’s eyes lit up at the question.